Home › Best-Sellers › Best Quality Artificial Plants And Trees Large Beautiful Japanese Fruticosa T..
Best Quality Artificial Plants And Trees Large Beautiful Japanese Fruticosa T..
Best Quality Artificial Plants and Trees, Large Beautiful Japanese Fruticosa Tree, Handmade Using Real Bark & Synthetic Leaves, Indoor Plant - 165cm Tall. This tree is hand made, so each individual tree will be different. The sizes and shape may vary. Height: Aprox 165cm Tree is supplied in a plastic terracotta coloured pot.... for easy insertion to your own planter. Sales Tax Free. Any orders from any state within USA are sales tax free.The price you see is the price you pay View the manufacturers promotional video on YouTube for this beautiful tree by searching: Japanese Fruticosa Tree "Can You Believe It's Artificial". An artificial tree of stunning proportions standing at 165cm. Virtually maintenance free, this artificial tree has been carefully packed to reach you in pristine condition. Plant type - Japanese Fruticosa supplied in plastic terracotta pot (perfect to place in an outer planter of your choice). For over 2000 years these trees have been used to bring natural karma to hi temples throughout Japan. For the first time this elegant artificial tree has been meticulously re-produced to the finest detail, with genuine bark and the finest lifestyle leaves, this truly is the contemporary focal point of any home interior. 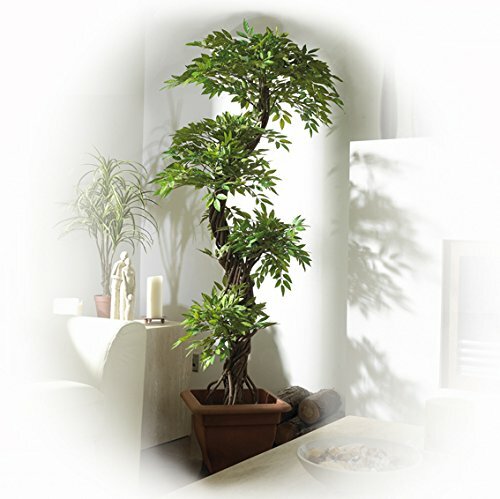 If you are looking for the perfect interior decoration then this contemporary artificial tree is for you. Perfect for home interiors and business interiors, the Fruticosa tree is a stunning example of what a contemporary artificial tree will bring to your office decoration or home decoration. This tree is hand made, so each individual tree will be different. The sizes and shape may vary. Height: Aprox 165cm Tree is supplied in a plastic terracotta coloured pot.... for easy insertion to your own planter.